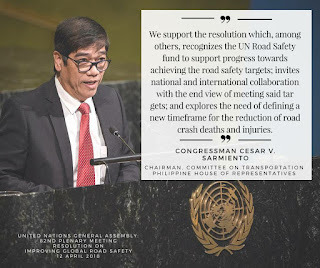 NEW YORK, U.S.A. — Congressman Cesar V. Sarmiento, Chairman of the Philippine House of Representatives' Committee on Transportation addressed the General Assembly earlier this week during the Plenary Meeting which adopted by consensus the resolution on "Improving global road safety." The Philippines co-sponsored the bi-annual resolution together with 71 other Member States, with the Russian Federation as the main sponsor. "The Philippines wishes to express its solidarity with Member States in reducing global deaths and injuries from road crashes and providing access to safe, efficient and sustainable transport systems," Congressman Sarmiento said. The resolution on "Improving global road safety" promotes the importance of reaching the road safety-related targets, such as target 3.6 under the Sustainable Development Goals (SDGs), which aims to halve, by 2020, the number of global deaths and injuries from road traffic accidents. Since 1999, the Philippines has enacted seven (7) laws that address key risk factors that were identified by the World Health Organization (WHO), in support of the passage of evidence-based global road safety laws, including the Motorcycle Helmet Act of 2009 and the Road Speed Limiter Act of 2016. According to the United Nations, road traffic crashes are responsible for more than 1.3 million deaths each year, while estimates of the burden of non-fatal injuries range from 20 million to 50 million. The Representative of the Lone District of Catanduanes and an active member of the Global Network for Road Safety Legislators also participated in the 25 Meeting of the UN Road Safety Collaboration at the UN Headquarters which commenced today upon the invitation of the World Health Organization (WHO). The two-day meeting officially launched the UN Road Safety Trust Fund at a meeting led by UN Deputy Secretary-General Amina Mohammed who urged all stakeholders to contribute to the Trust Fund and to step up their efforts to achieve global road safety targets. Every US$1,500 contributed to the Fund could save one life and prevent 10 serious injuries. 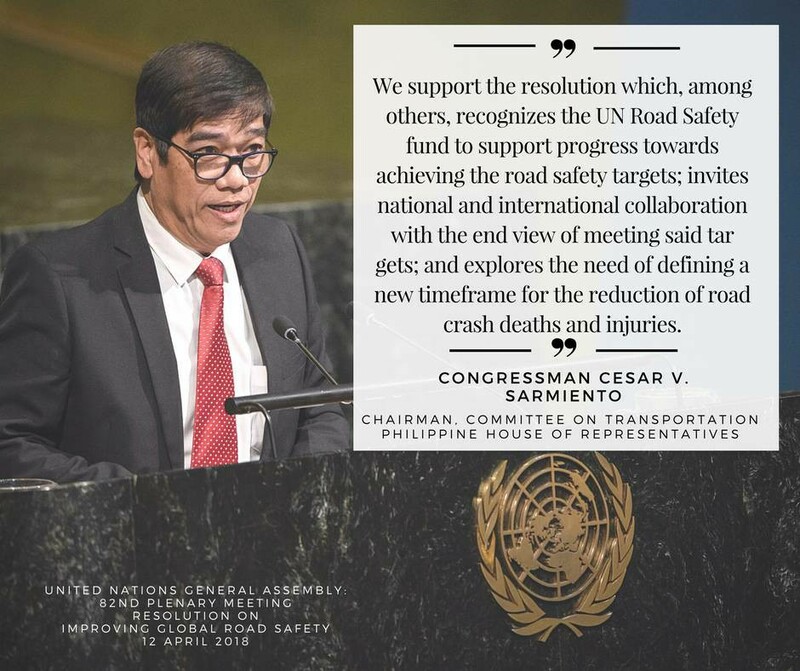 The Philippines recognizes the UN Road Safety Rust Fund to support progress towards achieving the road safety targets," Congressman Sarmiento stressed. In their capacities as UN Member States and Observers. the European Union, Monaco, Luxembourg, Sweden (host of the 2020 High-Level Meeting on Global Road Safety), Oman, U.K (represented by Prince Michael of Kent, Patron of the Towards Zero Foundation), Australia, Moldova, Armenia, Brazil, Czech Republic, Nepal, Spain, Nigeria, Tanzania, and the International Federation of Red Cross and Red Crescent Societies, delivered their respective interventions which expressed strong support for both the resolution and the establishment of the UN Road Safety Trust Fund. We put ourselves at the forefront together with the others to advance this goal in all its phases — politically, economically, socially and even culturally, for the sake of road safety," Congressman Sarmiento concluded.